Here is a quick step-by-step example of how to get started with BDD in IntelliJ. You can also follow these examples if you are using other IDEs, but some of the automatic good stuff may not happen (like auto-downloading plugins to help you edit the feature files and prompting you to import new Mavan dependencies). 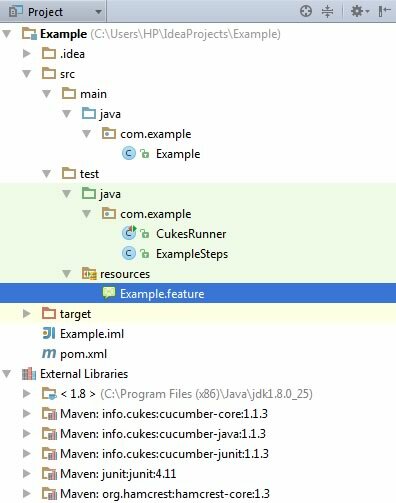 I tried a couple of BDD frameworks in Java before settling with Cucumber-JVM, which integrated really well. Here are the steps to follow to get going – the second project you use BDD with will be much easier as many of these steps don’t need to be repeated. Open IntelliJ and select “New Project”. To get started quickly, use the Maven archetype org.apache.maven.archetypes:maven-archetype-quickstart. This will start your project with a reasonable structure and will help you to follow this example. Enter some details for the GroupId (I have entered “com.example”) and ArtifactId (I have entered “example”. Click next. The next screen should be pre-completed, so just click next again. If you don’t have a path in the Maven path, you will get an error – download Maven if you haven’t already and then supply the path to the location you unzipped Maven to. I have entered the project name “Example” and allowed IntelliJ to select the project location for me. You will now have a new almost-empty solution with a neat structure. The external libraries in use are listed below. Don’t worry too much about the version numbers, these were the latest stable versions at the time. Maven will happily add all your external dependencies and you may see more than you asked for, because it will automatically grap any additional dependencies that the packages need. 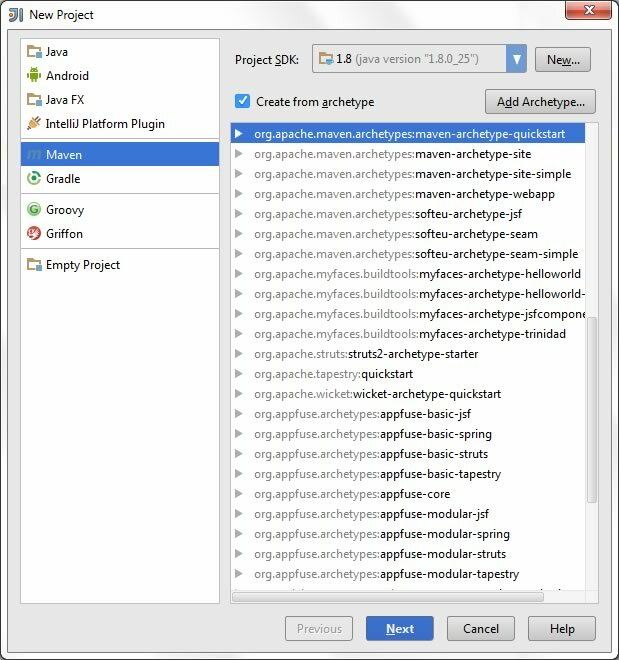 The quick start archetype will have added an App.java and AppTest.java file. Delete those – as we’ll be writing our program from scratch. You should now have a clean project structure like the image below, with just the folder structure for the program and tests and the “pom.xml” file and external libraries. Now that the basic project and its dependencies are set up, there is a little wiring to perform to join up your specifications to your test runner. You can do this using a single empty class with a couple of attributes. 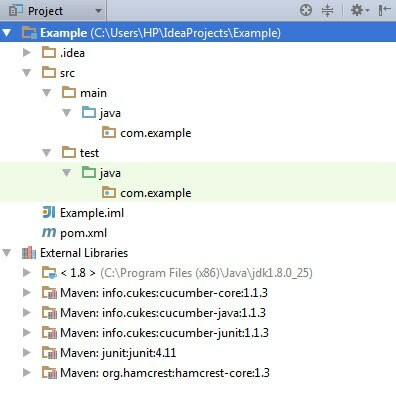 This wires up Cucumber to JUnit and tells it to find the feature files in the “src/test/resources” folder. 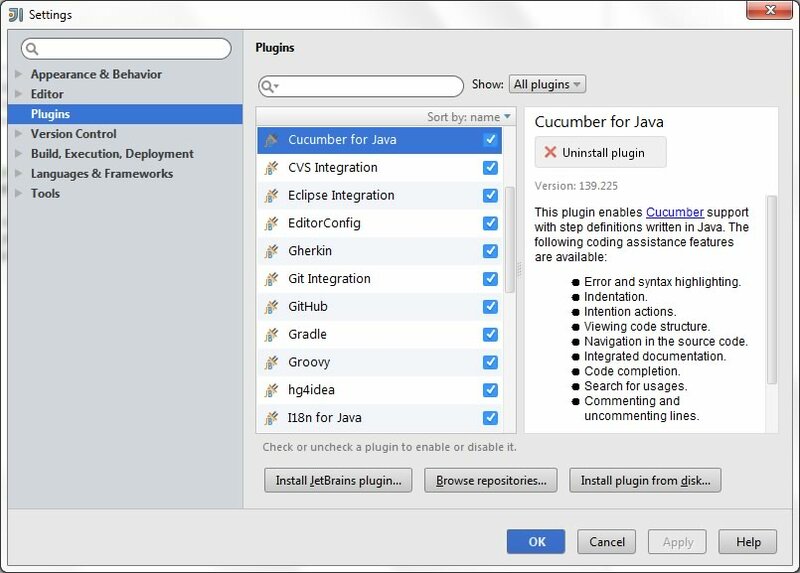 To get the best out of IntelliJ when working with Cucumber, download the Cucumber for Java plugin. You can do this by opening “File” > “Settings” and searching for “Cucumber” in the plugins search box. 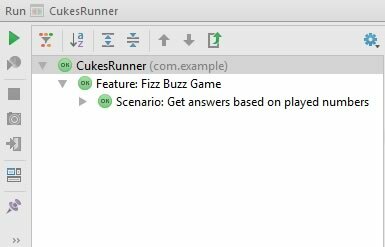 When we created the Cukes Runner, we told it to find features in the “src/test/resources” folder, so we need to add a new folder under “test” named “resources”. Once the folder is added, right-click and find “Mark Directory As” in the menu, then select “Test Resources Root” from the options. You can now add a new feature to this folder. Add a new text file named “Example.feature”. IntelliJ will prompt you to download plugins when you add this file – so accept the plugins. They will make it easier to work with the Gherkin syntax in your feature files. Then I should be told the correct answer is "1"
If you run the tests again, you’ll see that the output has changed to show the tests are ignored, because there is no implementation for the tests yet. You can see a more complete example on my Java Katas repository on GitHub.